Last week City Council approved the first phase of Mayor Jim Kenney’s Rebuilding Community Infrastructure program to repair and rebuild the city’s parks, playgrounds, recreation facilities, and libraries. One might ask: Why is this initiative necessary? Why have those facilities been allowed to deteriorate in the first place? Has this effort been tried before? The starting point to answering those questions is to understand the city’s past. Philadelphia: A Brief History explains how the Quaker city evolved over three-and-a third centuries in a compact and an eminently readable format. The book is built around two important themes: First is the recurring tensions between communal needs and private and personal gain. This is a particularly salient tension in Philadelphia’s history because William Penn himself articulated the goal of a harmonious and holy community, but one that would also be a prosperous settlement for the residents and for Penn himself. The tension is embodied in the name itself: Philadelphia was a city in ancient Greece, and the word does mean one who loves his brother, but it was also a prosperous port, and a place to which Saint John the Divine addressed a message in the Book of Revelations. So it embodied the ideas of prosperity, brotherhood, and holiness. The second major theme of the book is the role that the economy has played in shaping the city. The book is structured around the major economic and technological eras: the pre-industrial age, coinciding largely with the colonial period; early industrialism in the decades before the Civil War; industrial colossus, from the Civil War to World War II; and deindustrialization and the post-industrial age since the 1950s. Throughout the book, there is considerable emphasis on the physical city, the built environment, with three dozen illustrations and maps. Philadelphia’s history is written all over its landscape. To know how to read that landscape, not just City Hall and Independence Hall, but the public spaces, transportation lines, public institutions, and those facilities that Mayor Kenney wants to repair requires a sense of the past. This volume is an excellent place to start. Philadelphia: A Brief History is part of the Pennsylvania History series, short monographs on topics in the history of Pennsylvania published jointly by the Pennsylvania Historical Association and Temple University Press. These volumes are intended for a general audience as well as for high school and college classrooms. This week in North Philly Notes, Timothy Recuber, author of Consuming Catastrophe, writes about our media-induced empathy for disaster victims, and the problems associated with empathetic hedonism. From October 4th to October 10th, Hurricane Matthew trudged up the Atlantic coast from Cuba to North Carolina. It killed hundreds in Haiti and caused billions of dollars in damages in the United States. And for several days, it monopolized our attention, elbowing its way into public consciousness alongside the US presidential elections, as news networks provided live coverage in the States while citizen journalists sent shaky, handheld camera footage from locations throughout the Caribbean. In the storm’s immediate aftermath, harrowing tales of rescues mixed together with heart-wrenching stories of loss and earnest appeals to charitable giving on our televisions and computers. Then we began the process of forgetting. Presidential election coverage returned to its absurd heights. War crimes in Yemen took center stage among the foreign news reports. And life for all of us distant spectators of mass-mediated disaster returned to normal. While this pattern of public engagement with disasters is not surprising, it deserves scrutiny. What does it mean to understand the suffering of others in these ways? How does the increasingly intense and intimate coverage of catastrophes encourage certain kinds of reactions, and discourage others? What sorts of narratives win out when we understand disasters and loss through the succession of powerful yet fleeting mass-mediated experiences, where one disaster and then then next appear and disappear before our eyes? And how are new media technologies altering or reinforcing these patterns? These were the questions I set out to answer in Consuming Catastrophe: Mass Culture in America’s Decade of Disaster. I focused on a particularly tumultuous time period in recent American history: the first decade of the twenty first century. From the September 11th, 2001 terrorist attacks to Hurricane Katrina in 2005, the Virginia Tech shootings in 2007, the financial crisis in 2008, and the Deepwater Horizon oil spill in 2010, America was rocked by some of the largest disasters in the country’s history. Yet despite very significant differences in the duration, cost, and amount of lives lost due to these disasters, each followed a fairly similar path through mass-media and public consciousness. Using close reading and discourse analysis of news transcripts, documentary films, reality television programs, and digital archives, I was able to trace out some of the larger cultural norms that emerged during this period. Chief among these norms is the obligation to show empathy to those directly affected by disasters. In the book, I develop the concept of empathetic hedonism as a way to understand the media-induced pleasure in attempting to imagine what others are feeling, even if those feelings are painful. We are, I argue, increasingly asked to empathize with a whole host of suffering others today. And this certainly can be a good thing. But that empathy often comes at a cost. It is easily focused on individuals and their personal problems, but hard to direct towards structural issues. It is intense but short lived, such that the long aftermath of rebuilding is often ignored. And it works best with spectacular, acute disasters—like hurricanes—rather than long, slow, diffuse disasters—like global climate change, even though the latter has more damaging consequences than anything else. Thus we need to think critically about where and how our attention and emotion is being directed during and after disasters. And as I suggest in Consuming Catastrophe, we need to focus on the less spectacular work of creating a more just society all of the time, not just when disaster strikes. 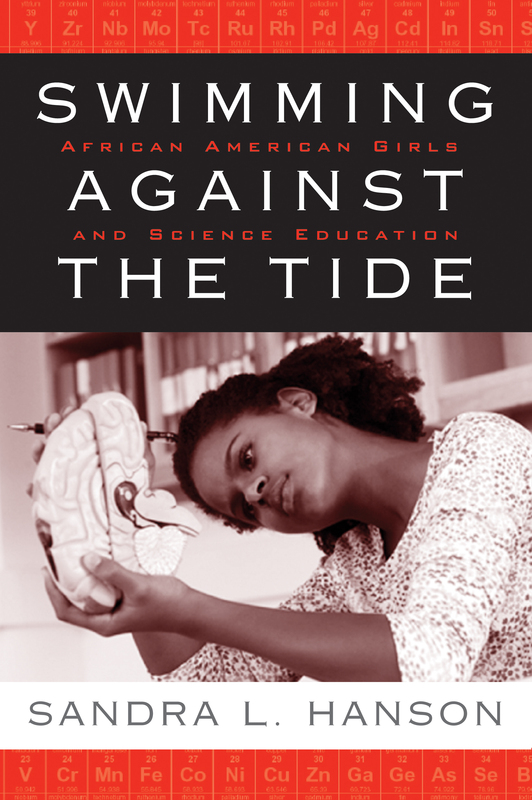 Sandra Hanson, author of Swimming Against the Tide explains that African American women are interested in Science, Technology, Engineering, and Math. A recent publication (in Cultural Diversity and Ethnic Minority Psychology) by a group of psychologists found that race and gender intersect in understanding Science, Technology, Engineering and Math (STEM) attitudes and participation. The research team was headed by Laurie T. O’Brien and focused especially on African American women. The researchers and subsequent media reports on the findings (e.g. in Inside Higher Ed and The Chronicle of Higher Education) expressed surprise at the high interest and participation in STEM among African American women. Several decades ago I began doing research on African American women in STEM funded by the National Science Foundation (NSF). Although some researchers have not focused on the way that race/ethnicity and gender interact to affect STEM experiences we have known for some time that we can expect the unexpected when it comes to African American girls and women in STEM. Some have argued that because women do less well in STEM and minorities do less well in STEM, there will be a double disadvantage for African American women. The argument of double jeopardy sees race and gender as additive. My findings from a representative sample of young African American women (published in a number of journal articles and in my book, Swimming Against the Tide: African American Girls and Science Education) suggested otherwise. Quantitative data from my sample and larger NSF surveys as well as open-ended questions and responses to vignettes were critical in measuring the young women’s experiences. They loved science. The young African American women signed up for science classes, loved doing experiments, went to science camp, and had posters of scientists on their walls. One young woman said that “science was like opening up a present from your favorite aunt.” My findings provided considerable evidence for the African American family and community as key in understanding this love of science. African American families have always made considerable investment in and had high educational and occupational expectations for their daughters. African American women have historically combined work and family roles. The answer to young African American women’s high level of interest and participation in STEM does not come from schools and teachers. In fact, the young women in my sample experienced considerable difficulty in the STEM classroom. One young girl reflected the opinion of many when she described the attitude of science teachers –“They looked at us like we weren’t supposed to be scientists.” The young women reported not being called on in the classroom and not being chosen as lab partners. Somehow, in spite of the chilly classroom climate, a disproportionate number of African American women manage to “swim against the tide” and persevere in STEM education and occupations. Data from NSF show that African American women persist in many areas of STEM at a higher rate than do white women. My recent research on the male dominated area of engineering shows that even here African American women earn the largest share of doctorates relative to men (when looking within race/ethnic groups). In my testimony to the U.S Congress (Subcommittee on Girls in Science) I suggested that we need better teachers, science classrooms, and science textbooks. When young African American women look around them and see white teachers and white scientists in the science textbooks, they do not feel welcome. The considerable agency that African American women show in the context of a white, male STEM culture is encouraging. One can only imagine the increased number of talented African American women who would participate in STEM education and occupations in a more welcoming climate. The major science organization in the U.S. – the National Science Foundation – has recognized the problem and is funding a good number of programs to encourage minorities and minority women in STEM. After all, diversity in science makes for better science. Statistics on degrees and jobs in science published by the National Science Foundation show progress for women and minorities in science, technology, engineering, and mathematics (STEM). However they also show that a gap remains, especially in science occupations. I am optimistic about the gains, but we must still work on making science more inclusive. These young women love science. However, when they go into the science classroom, one girl suggests that teachers “look at us like we are not supposed to be scientists.” What do these young girls say about changing the science classroom? They want, for example: better preparation in STEM in the early years and access to advanced STEM tracks in the later years, changes that make science more accessible, better trained and motivated teachers, smaller classes, more work in groups (cooperative learning), more hands-on experiences (and an active laboratory component), more gender and race diversity in science teachers and curriculum (especially text books), high expectations for all students, special programs to encourage women and minorities in science, and more access to mentoring and networking. My research and other research supported by the National Science Foundation suggest that these changes in STEM education would benefit all youth. In the Q and A after the testimony Representative Fudge (D-OH) asked about access to science for girls (and boys) in inner-city schools. I noted in my response a need to equalize resources across school districts. Children unlucky enough to be born in a lower-income school district should not have to deal with science classrooms that lack good teachers, textbooks and equipment. The committee inquired about other things that might be done to reduce the gender gap in science. I noted some of my research on girls and sport in my testimony. My research shows that sport provides an important resource in enhancing young women’s science access and achievement. It encourages independence, teamwork, and competition – the same traits that tend to be associated with women’s success in the male domain of science. Female athletes have an advantage in science over non-athletes. Young girls who are given an early opportunity to be involved in sport may well be less intimated and more prepared for the culture of science classrooms and work settings. It was encouraging to hear Representatives Ehlers (R-MI) and Fudge (D-OH) as well as Cheryl Thomas (one of the experts providing testimony at the hearing who is President and Founder of Ardmore Associates, LLC) express interest and support for this notion. When second grade girls and boys are asked to draw a picture of a scientist they often draw a white male who is alone and ominous looking. This is not an attractive image for boys or girls. We need to change the image of science for all youth and importantly we need to make science available to all. If we are to be economically competitive in an age of global markets we need diverse strategies, skills, and competence in STEM. Students in the U.S. (male and female) score behind students from many other countries on math and science exams. We need to improve the quality of our science education system. We know what works. The new practice guide by the National Center for Education Research (“Encouraging Girls in Math and Science”) offers five recommendations for schools and teachers for increasing girls’ participation and interest in science. Guides such as this one need to be integrated in a routine way into U.S. STEM programs.